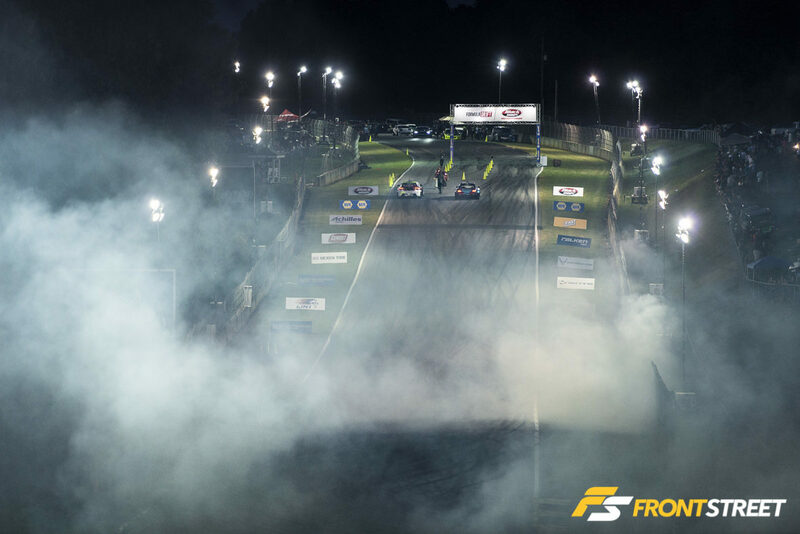 Celebrating its fifteenth anniversary as the United States’ premier drifting series this year, Formula Drift has been hosting a round of its chaos on the Keyhole turn of the famed Road Atlanta racetrack each year since the series’ inception. Road Atlanta even paved a custom route specifically for the very first round of FD all of those years ago, which is still being used today. This recent round of the 2018 season had us speechless when we left, so we compiled a list of the six reasons that made this round what it was. Now when I say speechless, there are a few different definitions. In this case, I’m referring to being completely out of breath and unable to talk from traversing the infield hills of this large racetrack in 90-degree weather, while carrying my heavy camera equipment on my back. If there was a breeze, it might have been slightly more manageable, but stagnant heat left me gasping for air after walking the nearly vertical hills from the paddock area’s autograph signing out to the back straight, where the drift course began. Once I made it out to the back straight, I took in the sights and sounds of the makeshift paddock area that the teams set up for quick tire changes, and parts fixing between runs. Ryan Lanteigne, a Formula Drift Judge, mingled amongst the drivers and went for ridealongs inside several random cars. I have a feeling it was less of a joyride, and more of an exercise to better understand the tactics of the drivers as they work their machines through the course. I’d imagine he took some mental notes of some drivers’ habits to be used in judging later in the weekend. The drivers must like this round of FD, due to the copious amounts of runoff area at every turn. Because this track is used for Petit Le Mans, where cars are entering this series of turns at over 160 mph(! ), there are significantly large gravel traps surrounding the entire group of turns. Justin “JTP” Pawlak found them early in the weekend, when his tire de-beaded on entry to the first turn, sliding him swiftly into the stones. A much better outcome than the abrupt stop on a barrier it would have been elsewhere. Let’s just say, there’s a reason they call it Hotlanta. Somehow every year, while most of the nation is welcoming the reasonable temperatures of spring, Atlanta skips those conditions and barges right into summer. This caused the drivers on the grid to figure out their own method for keeping not only their cars cool between runs, but also themselves. The skies were crystal clear, so there was no salvation from the scorching rays of the sun encroaching on the cockpit of each car. While some teams have equipped their car/driver with Cool Suit technology, which lowers the driver’s core temperature by flowing cold fluid through channels in their race suit, the majority of the field was visibly overheated, like Chelsea DeNofa escaping from his BC Racing Mustang RTR at any chance he had. There are quite a few stops on the Formula Drift calendar that occur during the golden hour just before twilight, but there’s some seriously addicting lighting conditions at Road Atlanta during sunset. When the sun is cresting just above the tree line, it’s fun to get a shot into the cockpit while the car is going back up the hill after its run. The backlit smoke makes for a very enjoyable detail next to the driver’s helmet. However, my favorite images are when the trail of smoke following a car is perfectly exposed, leaving everything else in the frame much darker. It’s a small window of time that offers this lighting condition before the sun seeks shelter beneath the trees for the remainder of the evening, but the anticipation of this time just makes it even better to photograph. The glaring sun may have intruded its way into Taylor Hull’s Comp Cams Cadillac ATS-V during his qualifying run on Friday evening, but it also gave me one of my favorite images of the event, before disappearing for the rest of the night. I’d say we should start with the first tandem between Ken Gushi in his GReddy Racing Toyota 86 and Matt Coffman in his Coffman Racing Nissan 240SX, but we’ll actually get back to that in a little bit. This stage of the competition saw early clashes of titans in the sport, pitting longtime compatriots Vaughn Gittin, Jr. in his Monster Energy Ford Mustang RTR against Ryan Tuerck in the Gumout Toyota 86. It was strange to know that one of these stars would be sent packing early, and I think that realization dawned on the competitors as they crept up each other’s doors throughout multiple “One More Time” (OMT) rulings from the judges, in an attempt to survive the round. In the end, Tuerck eventually moved on to the Top 16. Not just close competition, but also surprising performances by FD rookies highlighted the early battles. Taylor Hull filled every inch of the two outer clipping zones on his ascension up the hill, sacrificing his bumper in the process, against three-time champion Chris Forsberg in the NOS Energy Drink Nismo 370Z. Perhaps just as surprising was Forrest Wang’s rather untidy (by Forrest Wang standards) handling of his matchup with Jeff Jones. The Vapetasia Nissan Silvia’s pilot just wasn’t hitting the marks in his usual form, although he would eventually move on to the next round regardless. In a rather interesting matchup, Dean Kearney struggled with setup on his Oracle Lighting Dodge Viper all weekend and collided with Michael Essa’s Essa Autosport BMW E46 M3 during his entry to the course. When the pair switched places, Kearney’s Viper with a technical issue assured him an early sendoff when it caused him to miss the inside clipping point completely, and came to rest in the gravel trap. The E46 progressed on, while the Viper continued its forgettable weekend by getting towed directly back to the paddock from the stones. In the faceoff between “Rad” Dan Burkett in the RAD Industries Toyota Supra, and Jhonnattan Castro in his Gerdau Metaldom Toyota 86, the pair began their tussle by making contact before entering the course. Causing Castro to stop mid-turn, and take his car back for his team to look over before heading back out for his next run in the chase position. Well, they must not have looked as closely as they needed to, because the car’s axle failed during the next run. The 86’s rear wheel was wobbling terribly as it passed me into the keyhole, and sure enough the axle ejected itself out the side of the car, folding the car’s wheel underneath in the process. After the car had spun in a mess of smoke, the wheel popped upright again, and everyone involved was rather confused on what had actually happened to the car. If there’s one thing the Atlanta crowd has in spades, it’s a party atmosphere, and the Top 16 action on track mirrored this perfectly. Starting with… a Round of 32 battle? Yep, that’s right. GReddy Racing threw down their theoretical red flag, and “challenged the play,” claiming Coffman jumped the start of their earlier tandem. After reviewing the cameras during the event’s halftime break, FD officials agreed and decided the only fair way to handle the situation was by re-running the last piece of their tandem from the earlier round. So there it was, the 240SX leading the 86 around the track again, in a scuffle that would be further elongated by a OMT ruling this time around. Coffman must have gotten fired up at this change of fortune, and pushed his 240SX way out ahead of Gushi during his lead run. It was during his chase run, however, that Coffman struggled to keep up with Gushi, and in a bizarre twist of fate lost the round. Gushi, now back from the dead, advanced on to Top 16 competition. In another crazy matchup for Ryan Tuerck, he was lined up against James Deane in the Worthouse Drift Team S15 Silvia. The duo put on a tremendous show for the crowd, leaving an intense cloud of smoke behind their door-to-door skirmish. While James Deane advanced, it is worth noting that Tuerck’s car seems to be setup for any competitor and is in fine form this year. Two wildly talented drivers met in a Top 16 battle between Alec Hohnadell in the Rain-X Nissan 240SX, and Chelsea DeNofa in the BC Racing Ford Mustang RTR. At the start of the run Jarod DeAnda, Formula Drift’s announcer, urged the fans to hold up their cellphone lights to illuminate the night sky, which made for a pretty cool backdrop to the action on track. DeNofa won the round, and advanced further into the night. What started as a great weekend for second-place qualifier, Dai Yoshihara in the Turn 14 Distribution Subaru BRZ, ended earlier than he wished when a surging and charging Chris Forsberg eliminated him in their Great 8 encounter. The Subaru seems to be more dialed than ever before, and we’re looking forward to more solid showings from the former FD champion. Yes, it finally happened. 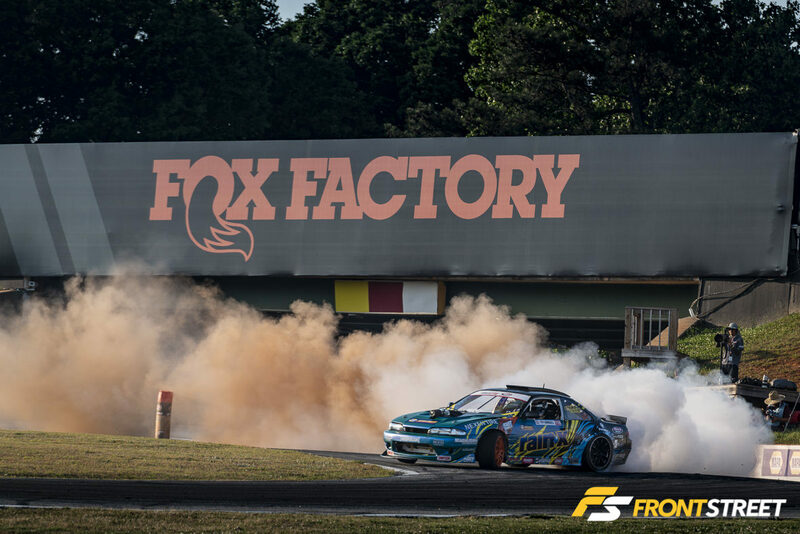 After countless near misses, and podiums in the stateside pro drifting series, Kristaps Blusš took home his first victory in Formula Drift. I just wanted to go back through his superb master class of driving an event that granted him the top step on the podium. Rewinding back to daylight, and the Round of 32, his first opponent of the event was Kevin Lawrence in the Enjuku Racing Nissan 240SX, who was frankly out-driven by the in-form Blusš, who was driving the guts out of his HGK Racing Eurofighter. The Kevlar-laden E92 had so much speed in his chase run, he nearly passed the S13-chassis climbing the hill, which forced Lawrence to physically drive the tires off his car trying to stay on pace with the Eurofighter. Something others would also struggle with through the night. Onto Top 16 against Forrest Wang, which would last deep into the night, as the pairing went back and forth with errors in each of their runs, which spawned a OMT ruling. Then that OMT was just too close to call, which yielded yet another OMT. Which brings us to a part of the night that had me shook for a little bit. For their first run, I had made my way up to the top of the track to be closest to the action, well within the spatial guidelines allotted for media. When Kristaps Blusš accelerated quickly ahead of a struggling Forrest Wang, the pilot of the green S15 threw his inhibitions to the wind and came into the keyhole with tons of speed in an attempt to close the gap. Unfortunately, his tires didn’t cooperate with this faster entry and he ran off course while carrying tremendous speed. Accelerating all the while in an attempt to point the rear of the car back down the hill for the rest of the course, the S15 came within feet of my face with significant speed, hurling dirt, rocks, and grass all over me in the process. In the seconds immediately following his departure from the grass, I was shocked a soaring outer clipping point cone hadn’t clobbered me. I checked to see if I got some keepers from the sequence, and turned around to see the entire crowd behind me seeking protection from the mass of tire smoke and dust that had engulfed the stands. All except one young gentleman with camera in hand, ready to be engulfed again. Bravo, young one! You’re ready for the big time. After the drivers switched positions, Blusš should have had his advancement all sewn up, but mechanical issues stalled his car mid-run amidst a sea of Achilles tire smoke from Wang. The two continued battling even while Great 8 tandems had already started, with Wang eventually losing to the strong Eurofighter. The night wouldn’t get any easier from here, as the HGK E92 faced James Deane in the Great 8, which proved another worthy adversary. However, the overall speed of the BMW just seemed to be unstoppable. It was at this point, everyone in attendance started to think this might finally be Blusš’ day after all. The stands settled in for the final battle of the night between Blusš and Fredric Aasbø. The pair was nearly inseparable throughout the course, which resulted in a OMT ruling from the judges. It was during this run that the winner was decided, and as the smoke lingered beneath the fluorescent lights, Kristaps Blusš was announced as the winner of a Formula Drift event for the very first time. In the end, it was just a really long day that made surviving the stagnant heat a struggle for me, coupled with the early rise to shoot the Global Time Attack event (look out for coverage later this month). I’ve since showered all of the dirt, grime, sweat, and sunscreen off me, but I’m already game for it to be thrown all over me again at the series’ next stop in Wall, New Jersey in a couple weeks time. See you then!